Methane (CH4) is a powerful greenhouse gas with the potential to accelerate climate change if emissions substantially increase. 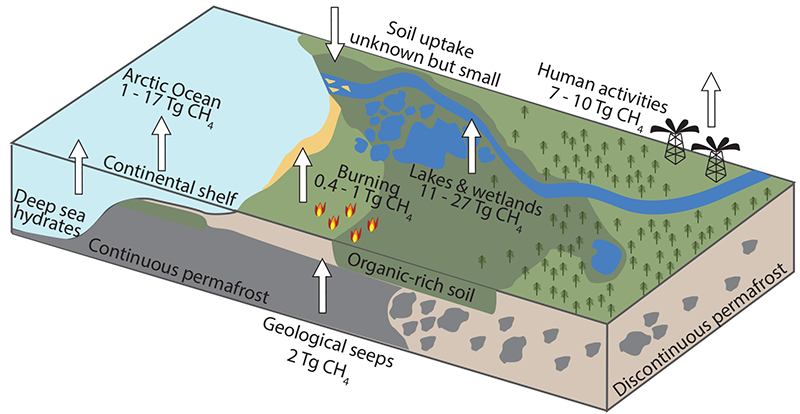 Models based on numerous field studies in recent decades estimate large CH4 emissions from wetlands, lakes, and marine shelf environments in the northern permafrost region. The Study of Environmental Arctic Change (SEARCH) launched a CH4 synthesis project with the goal of estimating contemporary budgets for CH4 in the Arctic and projecting rates of future release. An International Workshop to Reconcile Methane Budgets in the Northern Permafrost Region was held in Seattle from 7-9 March 2017. The primary goal was to produce a plan for reconciling methane budgets in the northern permafrost region. 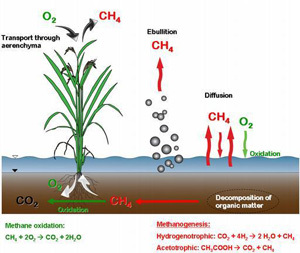 Fortytwo scientists, including representatives of the atmospheric, inland (wetland and lakes), marine (coastal and oceanic), and remote sensing communities studying methane dynamics participated in developing the research plan. The workshop included keynote presentations, breakout groups, and planning of activities. McGuire AD, Kelly BP, and Sheffield Guy L (2017). Resolving a methane mystery in the Arctic, EOS, 98, https://doi.org/10.1029/2017EO076733. Warming Climate, EOS, 99, https://doi.org/10.1029/2018EO091947.